On September 17, 1873: The Toronto Public School Board began search for a school site “at or near Leslieville” for inhabitants in eastern portion of St. Lawrence ward living south of Queen Street (then known as Kingston Road). From the Globe July 8 1881. School Section #6 was in the Township of York (north of Queen). The Willow Street School was in the City of Toronto, south of Queen Street. On Feb 18, 1874 they selected a site “west of Messrs. Leslie and Sons Nursery” on the north east corner of Eastern and Pape. 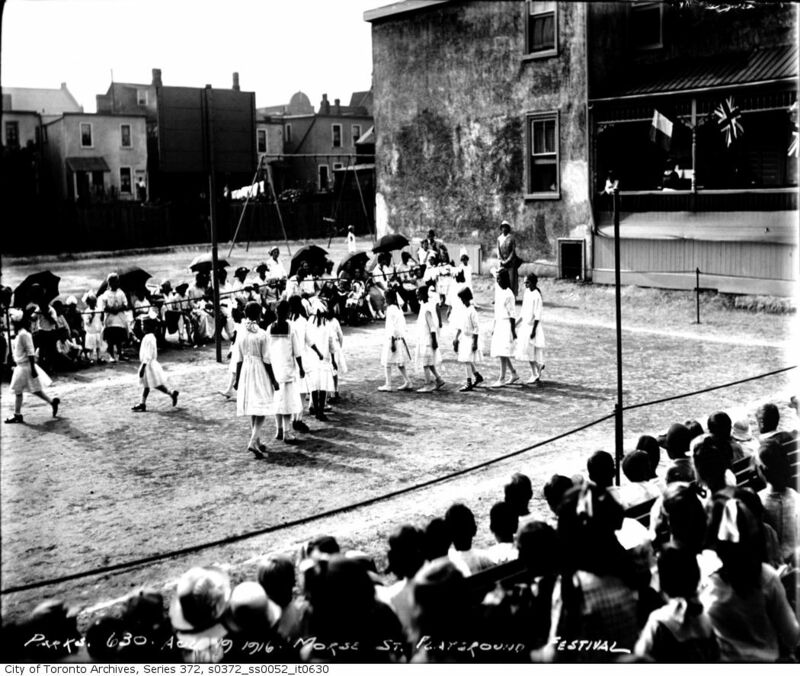 The two-room school was first called South Park Street School, but was soon officially named Leslieville School. The school was also sometimes referred to as Willow Street School. Pape Avenue was known as “Willow Street” because a huge willow tree grew at the corner of Queen and Pape. (Basketmakers lived on Willow Street, using the thin branches or osiers to weave their wares.) The Willow Street School was in the City of Toronto, not the Township of York. What is today known as the Leslieville Public School on Leslie Street was not the same school and not under the City of Toronto School Board. The Leslie Street School was under the York School Board until 1884 when Leslieville was amalgamated with the City of Toronto. Confusing now and probably confusing then I think. In 1884 when Leslieville north of Queen Street was annexed by City of Toronto, some street names changed to avoid duplication with streets in the old City of Toronto. On Feb 7, 1884 the City of Toronto’s Leslieville School had its name changed to the Eastern Avenue School—presumably to avoid confusion with the Leslie Street School. That school had been under the York Township Board but now fell under the Toronto School Board. A Morse Street site was purchased for a four-room school to replace the Eastern Avenue School. 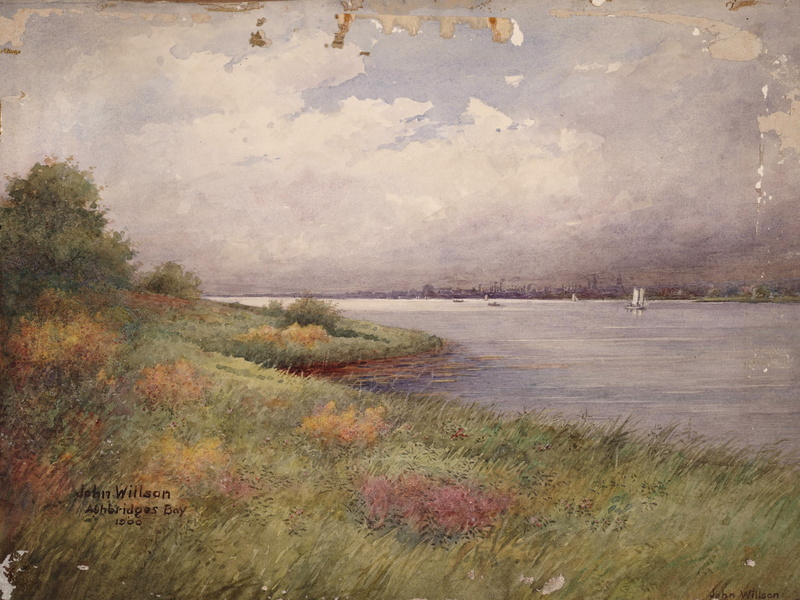 In 1885 the Eastern Avenue School and site sold by public auction. Richard Cunningham Windeyer (1831-1900), was chosen as architect. “None of the Tenders Acceptable. The Building and Sites Committee of the Public School Board met yesterday afternoon, when the tenders for the erection of a new school on Morse-street, St. Lawrence Ward, were opened. While the tenders were being examined, some remarks were passed by one of the members about the site chosen for the new school. Mr. Metcalfe accused Mr. Roden, the chairman, of having falsely stated that the site in question was a part of a swamp, and that if the school were erected there it would need a cast-iron cellar. The chairman, he said, had told a falsehood about the site. It was a very suitable one, and he did not see why any obstacle should be thrown in the way of erecting a school there. While St. Lawrence Ward paid as much taxes as any ward in the city it had the worst school accommodation. When the Rose-avenue School was being built the present Chairman had not thrown any obstacle in the way of that work, because he was interested in that section. Mr. Roden said he had not said anything against the site for the Morse-street School. Mr. Metcalfe said he had not got the Chairman’s support in the matter, and he did not care to have it. Mr. Roden said if Mr. Metcalfe was going to get mad about it, perhaps he would not be able to get the matter passed through the Committee. Addressing the other members of the Committee he said the appropriation for this school was $6,000, and as a third of that amount had already been expended in the site, he did not know if they could recommend the erection of the new school in the St. Lawrence Ward, as they would not have sufficient money left. In December 1885 the new school opened. In 1886 Morse Street School listed for the first time by the Board of Education with 222 pupils enrolled. In 1889 there was the first addition to Morse Street School. In 1890s, Leslieville grew rapidly. All the schools were overcrowded. Two temporary school rooms opened: at St. Clements’ Anglican and Queen St E Presbyterian. Older students had to walk to the Leslie Street School even from as far north as west of Pape all the way up to Danforth Ave. This was too far for the smallest children to walk. It had, at that time, 253 students. There was an average of 50 students a room, a student-teacher ratio that would be unthinkable today. The limits of Leslie street school have been extended west, including both sides of Pape avenue. This was done in order to close the temporary rooms at St. Clement’s church and the Presbyterian church. There were now 395 students at the Leslie street school. Nearly 50 would-be students could not go to school because of lack of space. Older students had to walk to the Leslie Street School even from as far north as west of Pape all the way up to Danforth Avenue. Attendance continued to increase. 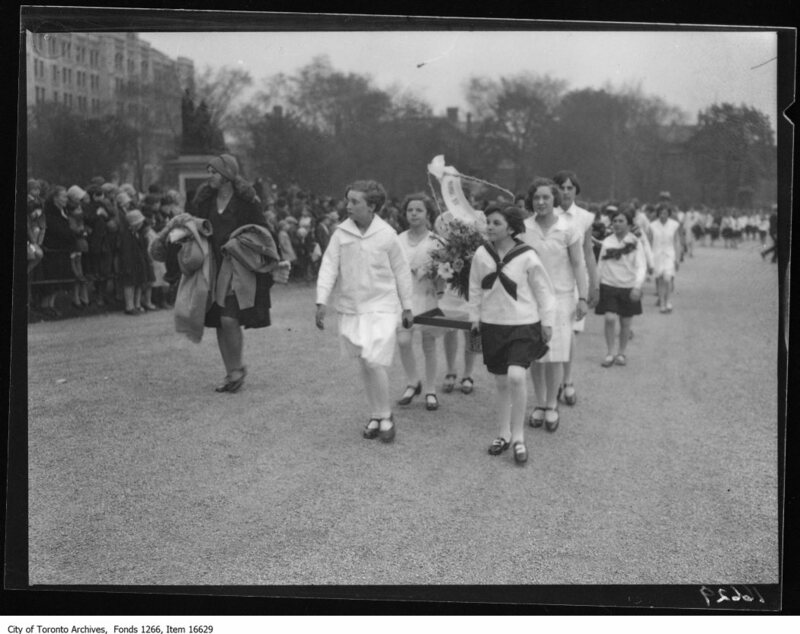 More children were going to Leslie Street School, Morse Street School – Leslieville schools, but also schools across the City. “East of the Don” had some of the most crowded schools in Toronto. The schools in this area were: Leslie, 404 students, seven rooms; Morse, 519 students, eight rooms. But going to school was exciting for many. “The cantata entitled “Queen Winter and Jack Frost,” rendered by the pupils of Morse street school, under the direction of Miss E. Williams, the principal, last night in Dingman’s hall, was a decided success in every way. 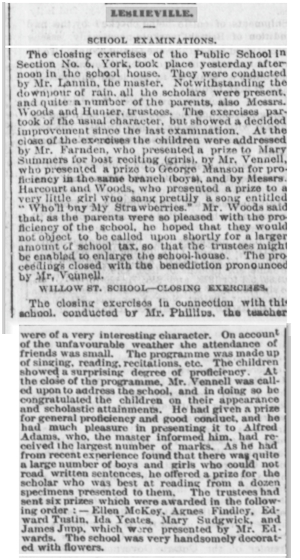 The hall was well filled with the friends and parents of the children, who showed that they were delighted with the way all performed their several parts by heartily applauding every act. The Masters Jordan rendered valuable assistance as accompanist and cornetist respectively. Messrs. H. Gilby, G.T. Pendrith and J.C. Clarke took the part of the Shepherds, and Mr. Pendrith the part of the Storm King in a very satisfactory manner. Everything passed off without a hitch and the enjoyable entertainment was brought to a close about 10 o’clock by the singing of the National Anthem. In 1895 there was another addition to the Morse Street Public School. Attendance continued to increase. In 1896 the kindergarten class at the Morse Street School had over 90 children. 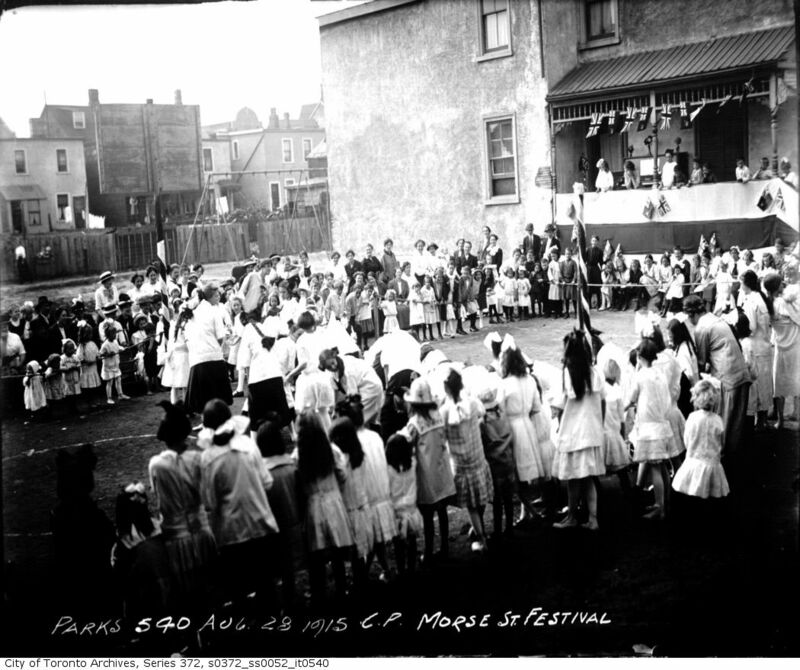 ”The Morse street school has an overflow class-room in the Sunday schoolroom at Queen street and Carlaw avenue. There is no school accommodation between here and Kew Beach, a distance of two and a half miles. At Kew Beach they want a two-room school and site. At present there are two junior classes in the school-room and chapel of the Kenilworth avenue Baptist church. The rooms are full of bewildering cross-lights from stained-glass windows. The dim religious light is not good for school purposes. The windows are on the casement plan and must be opened the whole length or not at all. Chairman Starr says the Board Must Make a Determined Stand—Children Must not be Crowded into Basements. In 1898 some Toronto School Board trustees fought tenaciously to have Miss Williams, the principal of Morse Street School removed — because she was a woman! They did not succeed. The Toronto Star article of October 21, 1898, sums up the arguments and reflects both the misogyny of the period and the changing attitudes towards women. 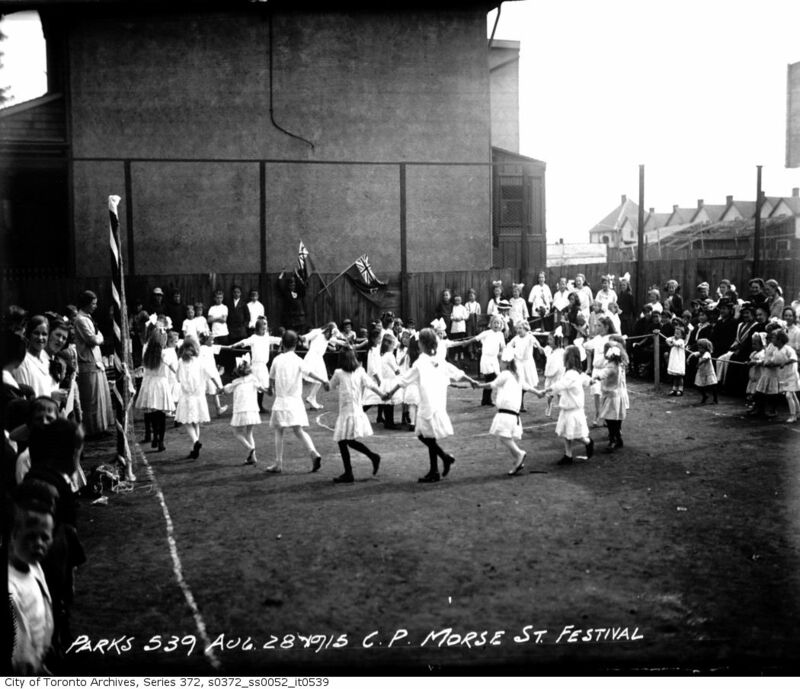 In 1909 there was another addition Morse Street Public School and in 1914 another. In 1931 there was another addition built. The school grew to 17 classrooms, three kindergartens, a staff room, offices and a health room. Empire Day parade, Morse Street School flower party. May 23, 1929. From the City of toronto Archives. In 1971 the new Morse Street school that we have today formally opened. 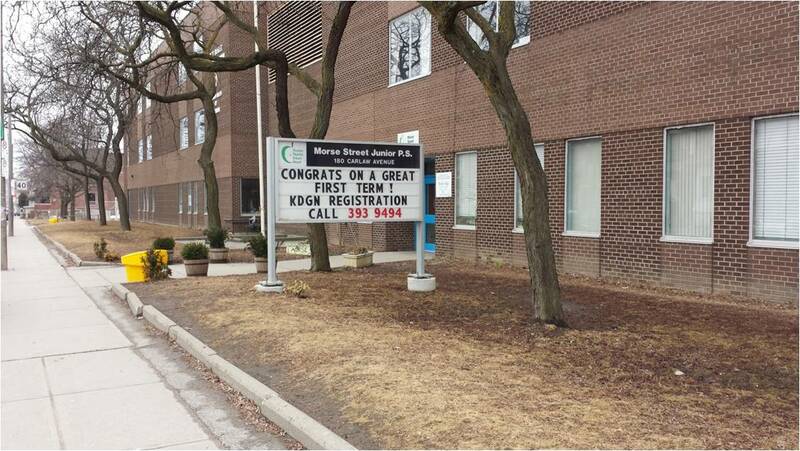 In 1999 the Morse Street Junior Public School 180 Carlaw Avenue celebrated 125 years serving the community. John Ross Robertson, Landmarks of Toronto, Vol. 1, 523.